Dianna obtained her degree in Bachelor of Arts in Management Economics with honors from the Ateneo de Manila University in 2009. 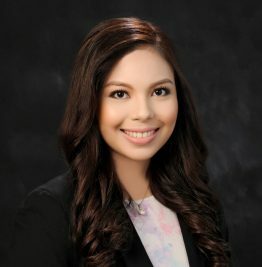 She obtained her Juris Doctor degree from the Ateneo de Manila University School of Law in 2013 where she graduated with honors. As a law student, she was a Teehankee Center Foundation scholar and Ateneo School of Law scholar. Dianna was admitted to the Philippines Bar in 2014 after placing second in the 2013 Philippine Bar examinations. Dianna joined C&G Law in 2014. Dianna specializes in corporate and commercial transactions, assisting in various due diligence and related activities involving mergers and share and asset acquisitions, and real estate transactions. She also specializes in taxation, which involve representing and acting for clients in challenging assessments and claiming refunds of various taxes before the Bureau of Internal Revenue, Local Board of Assessment Appeals, and Court of Tax Appeals. Dianna also assists in providing general corporate, tax, banking, intellectual property, and other advisory services. She has appeared before trial courts and other quasi-judicial agencies for civil, criminal, and tax cases. Dianna is also a part-time lecturer at the Ateneo de Manila School of Law, where she teaches Constitutional Law and Legal Writing. Assisting in various due diligence projects involving the proposed acquisition of properties of or shares of stock in a manufacturing company, holding company, online grocery company, and food distribution company, as well as the drafting of due diligence reports and advising on issues relating to such acquisition. Assisting in drafting and reviewing contracts in connection with the acquisition of real properties by a leading real estate company in the Philippines for development into commercial and residential projects. Assisting in drafting and reviewing operating agreements, technology transfer arrangements, software licensing agreements, mortgage trust indentures, loan agreements, share purchase agreements, and other contracts for multinational and local clients. Advising foreign and local clients on foreign equity restrictions in certain Philippine industries, such as the banking and financing sector and the local real estate industry. Advising clients on technology and data protection. Assisting in preparing and protesting national and local tax assessments and claiming refunds before the Bureau of Internal Revenue (“BIR”), Bureau of Customs, Local Board of Assessment Appeals (“LBAA”), and the Court of Tax Appeals (“CTA”). Representing a leading building materials company in proceedings before a LBAA challenging the assessment of real property taxes where the propriety of depreciation of machinery is the principal issue. Representing a mass transportation company in proceedings before the BIR involving the assessment of various alleged deficiency taxes (i.e., income tax, improperly accumulated earnings tax, expanded withholding tax and documentary stamp tax) in the amount of around P6 Billion. Representing a mass transportation company in proceedings before the CTA involving the assessment of various alleged deficiency taxes (i.e., income tax, value added tax, expanded withholding tax, final withholding tax, fringe benefits tax and documentary stamp tax) in the amount of around P6 Billion, including the drafting of pleadings, judicial affidavits, legal memoranda, and other legal documents for such company. Assisting in preparing and filing tax treaty relief applications before the BIR involving alienation of shares. Assisting in the filing of various tax compliance requirements for the sale of real properties and shares of stock for a leading building materials company. Assisting in the negotiations with local government tax officials for the settlement of tax liabilities of a leading building materials company. Assisted in the negotiation and settlement of alleged deficiency taxes with the BIR of an animal health company. Assisting in copyright and trademark search, including advising clients on potential copyright infringement liabilities, including registration of trademarks with the Intellectual Property Office. Assisting in drafting pleadings, judicial affidavits, legal memoranda, and other legal documents in a case for nullity of marriage as well as prosecution for theft. Assisting in drafting and reviewing code of conduct and discipline for a manufacturing company as well as employment contracts. Special Proceedings: Essentials for the Bar and Bench (2015). What Internet Service Providers Do Not Tell Us: A Study on the Legality of Non-Disclosure of Network Management Practices (2013), Juris Doctor thesis, Ateneo de Manila University School of Law.